An academic paper written by William Arthur Bigham III (1982-) for a course at the State University of New York at Brockport on food and culture on December 19, 2011. Topics discussed in the paper include Bigham's interview with his mother, Patricia Ann Black (1956- ), about her experiences as the child of migrant workers; how migrant workers lived; the difference between education and race relations in the North and in the South; the logistics of working in the fields; and how the Federal government changed migrant work. William Bigham III was born in Rochester and raised in Wayne County, New York. He began teaching microbiology and anatomy at the SUNY Brockport in 2013. He is the son of Patricia Black, the grandson of Pilgrim Black (1905-2002) and Lula Mae Haynes Black (1917-2007), and the great grandson of Harry Black (d. 1911) and Maggie Benjamin Black (ca. 1870-ca. 1934), who migrated to Sanford, Florida, from South Carolina in the 1800s. Bigham's grandparents, Pilgrim and Lula, were migrant crew leaders, and thus migrated to Upstate New York in the summers and back to their home in Sanford for the rest of the year. Digital reproduction of original paper by William Bigham III, December 19, 2011. Originally created by William Bigham III. Copyright to the resource is held by William Bigham III and is provided here by RICHES of Central Florida for educational purposes only. I interviewed my mother for this paper because of her experience on the subject of the migrant life. Her family worked in the migrant agricultural field for years back in the 1950’s and 1960’s. Every year before the fruit harvesting began my grandfather would assemble a crew down in Florida to bring up to New York. The crews were made up of mostly men but often there would be married couples as well. Often single men were preferred over married men or families. The reason for this was because they would be able to work harder. Single men would have fewer distractions and would be more willing to live in and put up with the conditions of the camp. Once the crew was assembled they would travel up to New York by bus. My grandfather would drive the bus with the people on it and my mother’s uncle (Uncle Buddy) would drive a truck with everyone’s belonging. The trip would take a few days. My grandfather knew all of the stops on their route that were friendly toward black people. You have to remember that this was back in the 50’s and 60’s so racism was still quite prevalent; you couldn’t just go to any gas station or restaurant, you had to go to ones that excepted business from black people. As a young girl this allowed my mother to be exposed to as little of this racial environment as possible. As a parent I would want to protect my child from having to experience this type of situation. This also allowed the trips to and from New York to be somewhat enjoyable and to have an almost vacation like feel. The camp consisted of a house “big house” and a series of single room “huts”. These huts were very minimal in what was in them. Many of them were no bigger than 10’x12’, enough for one to two beds. There was also a kitchenette which consisted of a tiny gas stove and a table. These huts had no insulation and only one light socket. They would screw an adaptor in to the light socket that had electrical outlets and a light socket in it. This was the only way to get electrical outlets into the room. There was also no running water on the camp, so everyone had to use the water from the well. There was also no indoor plumbing so everyone had to use the outhouses. Basically these huts were Spartan in nature. They were meant for only the bare minimum, rest after a long day of work, not for comfort. The main house was a two story building that did have insulation but still no running water or indoor plumbing also it had only one light socket per room. As a little girl my mother looked at living on the camp as going camping for a little while each year. Coming up north allowed my mother to attend a better school for a few months out of the year. Also it allowed her to attend a non-segregated school. While schools were not supposed to be segregated they still were. It was just a part of life in the south. Also they “black” schools got the used books and second rate supplies compared to the “white” schools down south. My mother recalls a time when she was in school in Florida and one of her books was from the very school she attended while in New York. It was a used book that had been sent down for that school to use because they could not afford new books. While life on the camp may have been a little Spartan, everyone on the camp made the choice to be there. As my mother put it we would sacrifice and live poorly for a few months and return to Florida to live like kings. A few people would work like crazy while up north and make enough money to last them all year long. While they were back in Florida they wouldn’t need to work. From my experience as a child living in Wayne County, the children of migrant parents always had nice clothes and were well kempt. They always had the same stuff as the other kids and sometimes maybe even nicer things. The area where I grew up wasn’t exactly the richest place in the world but we were always happy so I can assume they were at least as well off as I was. Referring back to living like kings, according to my mother when the migrants would go back to Florida they were some of the better off people in their respective neighborhoods. They would have the nicer homes and the new cars. Back in the 1960’s migrant workers would get paid around $10 for a bin of apples, which was a lot of money back then. If you were a skilled worker you could easily fill two bins an hour, even more if you were a couple or family that was working together. Out in the orchards you would pretty much bring what you needed for the work day, like water and food and whatever sun protection you wanted. The farmer did not supply water for you so you had to make sure you had some of your own. My Grandfather would bring a keg filled with water for the worker each day; this is something he did on his own. He was essentially their supervisor/manager so he felt an obligation to make sure they had the things they needed. He was in charge of tallying everyone’s bin count so that they got paid the correct amount each week. Also he would organize the weekly trips into town so people could get groceries and other things. My grandmother would make and sell meals to the workers who wanted, usually to the single men; she would charge around $7 a day for three home cooked meals. At the end of each week on payday after everyone was paid they would go and pay my grandmother for the meals that they had eaten. My mother told a story of a couple that worked so hard, the farmer didn’t have enough money to pay them; they had to wait till the season was over and the farmer had sold his apples and gotten more money. This story shows just how much money there was to be made if you were willing to work hard. My mother feels that this system/life style definitely does not exist nor could it exist today. Once the government got more involved things started to change. The biggest thing that changed this way of life was when the government forced the farmers to start paying by the hour instead of by the bin. This greatly reduced the amount of money you would make. You could only make so much money in a day base on the hourly system but getting paid by the bin allowed you to make vastly more money, the faster/harder you worked the more you were paid/rewarded. A lot of people refused to work in this new system, they knew what they could have been making and did not want to be doing the same job for less money. This is the time when a lot of people got out of the migrant field and went on to other things. While some things may have improved like running water and indoor plumbing and electricity, other conditions are worsening. Conditions like what they are paid and their work environment have steadily gotten worse. Many African Americans would not tolerate these new conditions and that is one major factor as to why Hispanic people displace African Americans. Back then the conditions may have been hard but it was a conscience choice that was made by all that travelled up north. If you worked hard and made a small sacrifice for a few months you would be rewarded for your efforts, it would allow you to live well the rest of the year. This is not the case anymore; you work hard and still will be struggling to get by. In the old system the farmer made money but the worker also made a living wage; in this new system the farmers still make their money but now the worker is struggling to make ends meet, no matter how hard they work they just can’t seem to get ahead. We really need to look at our current agriculture system, and decide if we want cheap food that comes from the broken backs of the people who pick them and the horrible treatment of animals or do we want food that comes from people that made a living wage and animals that were humanely raised. If it meant that my food cost a little more I know which choice I would make. While conditions may not have been ideal the old system at least allowed people to live, the new system is little more than modern legalized slavery. Bigham, William, III. 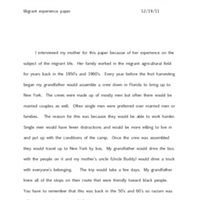 “Migrant Experience Paper by William Arthur Bigham III.” RICHES of Central Florida accessed April 20, 2019, https://richesmi.cah.ucf.edu/omeka/items/show/2989.